This Mini Reverence is a smaller size version of his Reverence folder. The blade length on the Mini Reverence measures approximately 3.5″ and has a beautifully hollow ground blade. Oddly, I haven’t found too many reference to this knife at all, as most seem to be about his full-size Reverence folder. 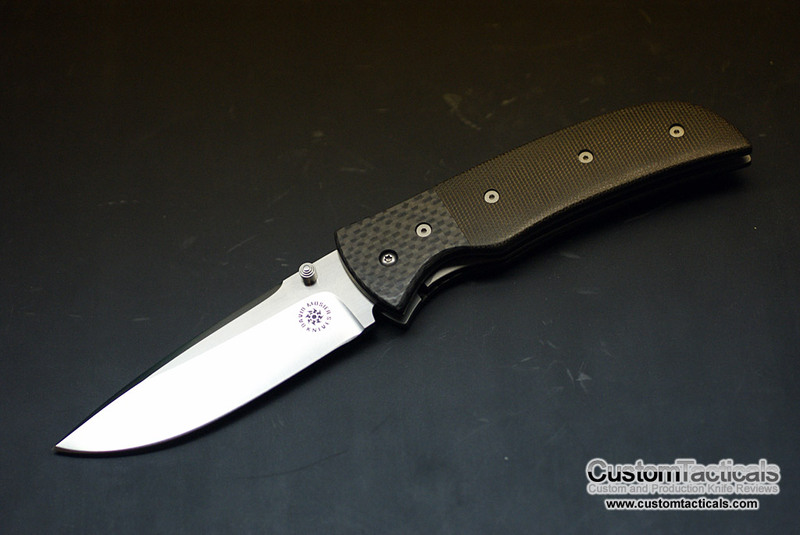 The 3.5″ blade is made from what I believe to be CPM-S30V, but since it isn’t marked, I can’t say for sure. As I’m sure most of you know, it is very common for custom makers not to mark their knives with blade steel. What the reason for this is, I am unsure. Either way, judging by the age of this folder, which is probably at least 5-6 years old, the blade steel is probably S30V, or possibly 154CM/ATS-34. I did not do any test cutting or sharpening to see if I could guess, but the blade is quite sharp and will shave hair. David Mosier’s grind lines are crisp, straight and pleasing to look at. These are key attributes to a good custom knife, and Mosier has that down pat. 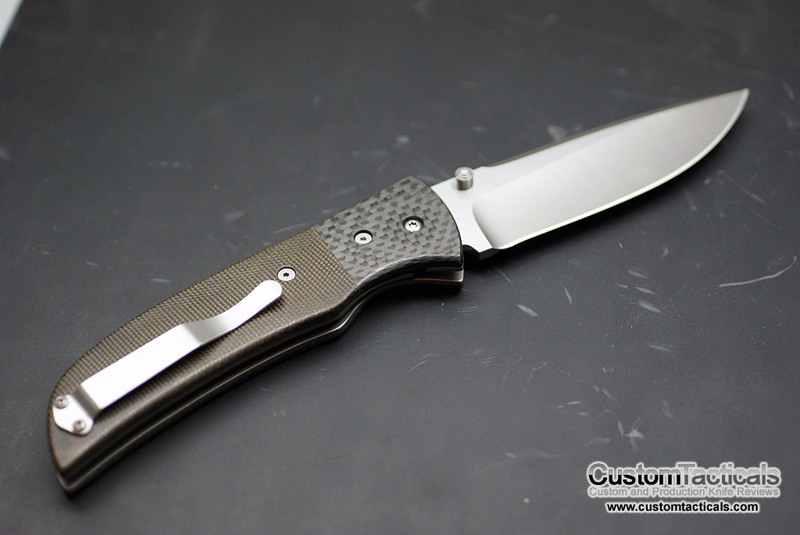 The blade finish is satin with what appears to be hand rubbed flats. Thumbstud is ambidextrous, which is always a plus. I always prefer double thumbstuds because there are some times when I need to open my knife with my left hand. My main gripe with this knife is mostly the handle. Its probably because this is an older Mosier knife so the knife handles aren’t fully contoured. Looking through his website and other photos online I have noticed his newer knives all have contoured handles. This one has flat handles that have been rounded on the edges, giving it a somewhat less professional looking finish, and is less comfortable in the hand. 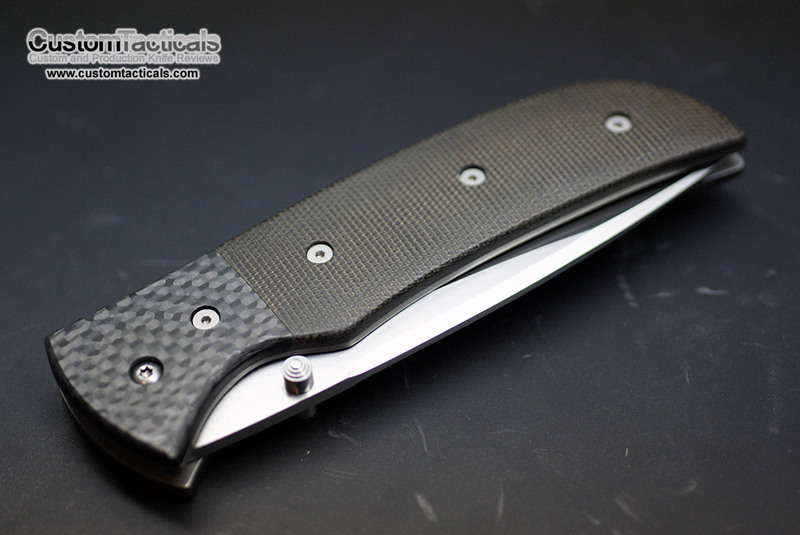 The bolsters are carbon fiber and the handle scales are canvas micarta, which is a great combination. Good grip combined with lightweight feel. The pocket clip is standard profile and mounted for tip-down right hand carry, which is fine with me. Overall fit and finish is very good. No blade play and relatively thin washers used in the pivot all point to good mechanics and high tolerances. I wish the handles were fully contoured, but since this is an earlier example of Mosier’s work, I understand that his techniques have improved. The blade finish and grind are very good, which shows really well and is really the heart of the knife. David Mosier does good work and I look foward to owning one of his newer pieces in the future.